There are two methods of having your brand/name/logo on ceramic or glassware, direct print or transfer (decal) kiln fired print. In both cases these are screen printed. For each colour/position a separate screen is made from film. Another process is also available for mugs only, which is a digital print. This method does not require film. 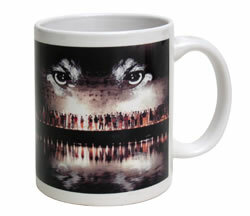 With direct printing the image is printed directly on to a mug or glass. The limitations with this process are the style of mug must be cylindrical (not Cone or Flare Mug), the number of colours and the registration (interaction) of the colours. The handle is the reference point to print the image on a mug and allows more than one colour to be printed as long as the colours do not touch (register). As a glass has nothing to reference to, only one colour can be printed. A transfer print is where an image is printed on to special paper. The image may have multiple spot colours in some cases 8-10 colours may be achievable. A spot colour is an individual colour printed in a position that does not interfere with another colour. Once the image is completed, a covercoat is applied which allows the complete image to be removed from the paper when immersed in water. The transfer is then hand applied to the surface then kiln fired up to 800 °C where the logo is baked into the glaze. Digital Printingon mugs allows for a complete spectrum of colours for logos, images or photographs to be printed and gives a result that cannot be achieved with screen printing. Most artwork file types are useable Artwork is a jpeg format at minimum 300dpi for best results. This process is only available on white D Handle mugs suitable for all ceramic glazed surfaces and is an ideal solution for small quantities. Historically we have used the now common sublimation process however with the new kiln fired system the finished products are not prone to failure in a dishwasher or sunlight (UV). In most cases, clients provide PMS or Pantone colours for their logo. We match to these colours as best as possible however some colours are not achievable. Due to the formulation of several colours there may be an extra cost involved. Direct printing especially on to dark coloured glazes (black, cobalt) allows vibrant colours like, red, orange, yellow etc to be achieved unlike a transfer print. These colours are durable in a dishwasher environment. Transfer kiln fired printing colours due to the nature of the process are limited as some colours are not able to be achieved like cyan and magenta. Different types of glazes on ceramics can also vary the colour outcome. Some colours are derived from precious metals – gold and platinum (silver) as well as maroons, purples, lilacs and pinks and therefore do have additional costs. 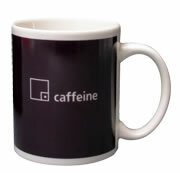 On ceramic mugs there are several positions that logos/images /text can be positioned. One side or two sides, maximum print area 70 x 70mm per side for kiln fired transfer and 60 x 60mm for direct printing, there are limitations to the width of the logo due to centering it perpendicular to the handle. When deciding which side of the mug the logo is to be positioned, use the handle as the reference e.g. When holding mug in your right hand, logo is facing away. 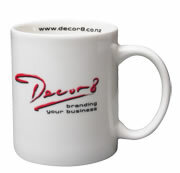 Wrap print – where the logo/image is positioned completely around the mug, size is dependent on the mug style. Inside lip prints – this position lends itself to text including website address or personalised names although logo can be positioned here depending on the size. Inside lip prints require curving to ensure it is straight when applied. Handle prints – like inside lip, text and web addresses are common but do not require curving. This option may not be suitable for some handle shapes. Backstamps – these may be placed on the underside of the mug. Kiln fired print is the most durable on ceramics as it is baked into the glaze. Glassware that has been kiln fired is recommended for hand washing only due to the aggressiveness of the caustics for domestic dishwashers. Direct prints are dishwasher durable and are very popular particularly on glassware for “frost etch” type prints. 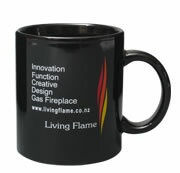 Digitally printed mugs we recommend hand washing for longevity.